Have you ever finished a book that was so crazily intense at the end, where something shocking and then really good happened that you just wanted to about cry for being so sad and so happy all at once? That is how I felt after finishing Dream Boy. I became so connected and invested in these characters and their story that my emotions were pulled tight as this one came to a close. When an author can write in such a way to make me feel these emotions, then she has done her job. What more could I ask for in a book? I immediately connected with these characters. I loved Annabelle, even though she is in denial for most of the book about a couple things and I wanted her to choose something different than she was. I loved Will. Oh, did I love him! His heart and loyalty, his intelligence and wit. I also loved Martin. He was such an interesting character and I liked seeing how he would react to things, under the circumstances. Then there were all these secondary characters that made the story so full. I love Annabelle's friends and her family. They were great! I loved how all the characters felt authentic and fully fleshed out. The story pulled me right in from the beginning. It was such an interesting concept and I was trying to figure out exactly what was going on and how. What I liked was that it's never explained per se how scientifically it all worked, but it still made sense to me, so I didn't have any believability issues. Then you could feel the tension slowly building as the story reached its climax, which was done so well. You know how some stories take forever to get to the climax and then it's over so quickly and it feels rushed? This didn't feel like that, which I appreciated. It was intense and paced really well and I felt it gave what the story needed. My only complaint would be that I wanted the very end to be extended more. ...a worn copy of The Veleveteen Rabbit, which had always made me cry. "Real isn't how you are made," said the Skin Horse. "It's a thing that happens to you. When a child loves you for a long, long time..."
I would definitely recommend Dream Boy to those who enjoy suspense, paranormal, contemporary, and romance. It was a balanced book that didn't focus too much on just the romance, the paranormal parts, or just the suspense, but was a good mix of them all. It was definitely worth the read for me! Content: There were a few crude comments and some innuendo (these were high school students). I can't remember any swearing. I would say this one was pretty clean. Source: I would like to thank Sourcebooks Fire for my review copy received through NetGalley, which did not affect my review in any way. What do you think? Have you read this or plan to? 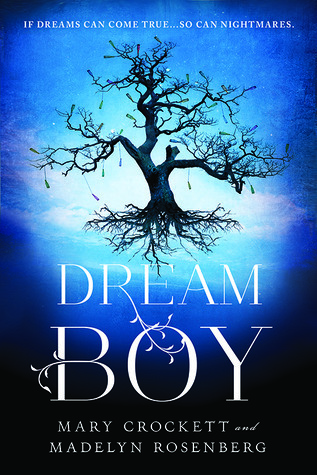 In case you missed it, the authors stopped by today with a dream cast for Dream Boy and there's a giveaway too, so go check that out here. I hope we both love them!! It really fits the story - now that I've read it. It is. I also like how the city is upside down or reflected on the bottom half too. Publishers do have cover designers or people who handle that. I would love to be included in that stuff too. Very fun!